In this combination of Nov. 9, 2017 photos, U.S. President Donald Trump, right, and Chinese President Xi Jinping speak during a business event at the Great Hall of the People in Beijing. Facing the risk of a mutually harmful trade war, the world's two biggest economies have put their differences on hold. Yet it's far from clear that a fragile truce between the United States and China can hold. 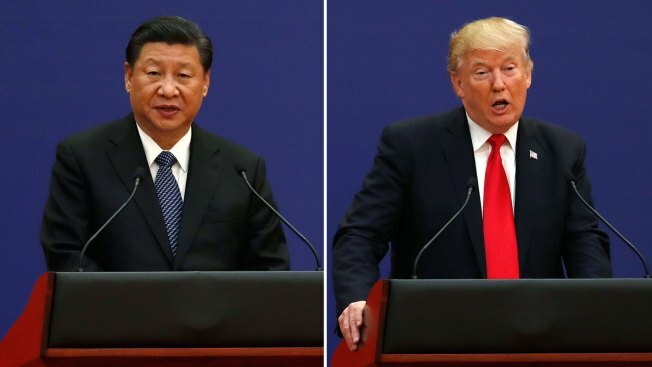 In exchange for the United States agreeing to hold off on tariffs on up to $150 billion in Chinese goods, Beijing agreed over the weekend to "substantially reduce" America's huge trade deficit with China. Beijing made no specific commitment, though. Treasury Secretary Steven Mnuchin's declaration that the American tariffs would be suspended cheered global markets Monday on relief that the two countries had stepped back from the brink. The celebration could prove premature. "We are not out of the danger zone yet," said Nick Marro, a China analyst with the Economist Intelligence Unit. "There is still a high risk of a trade war, even if the timeline to getting there has been extended." Beijing refused to knuckle under to a U.S. demand to slash the U.S. trade gap by a specific amount: $200 billion, a figure seen by most economists as wildly unrealistic anyway. The U.S. ran a deficit with China in goods and services last year of $337 billion, including a record $376 billion in goods. A vague statement the two countries released said next to nothing about the issue at the heart of the dispute between Washington and Beijing: The hardball tactics China uses to challenge U.S. technological supremacy. Those tactics include a requirement that American companies hand over some of their technology in exchange for access to the Chinese market. U.S. Trade Rep. Robert Lighthizer issued a sharp statement: "Getting China to open its market to more U.S. exports is significant, but the far more important issues revolve around forced technology transfers, cyber theft and the protection of our innovation." "The U.S.," Lighthizer continued, "may use all of its legal tools to protect our technology through tariffs, investment restrictions and export regulations. Real structural change is necessary. " President Donald Trump is dispatching Commerce Secretary Wilbur Ross to try to settle on the kinds of details that were sidestepped in last week's talks with a Chinese delegation led by Vice Premier Liu He. 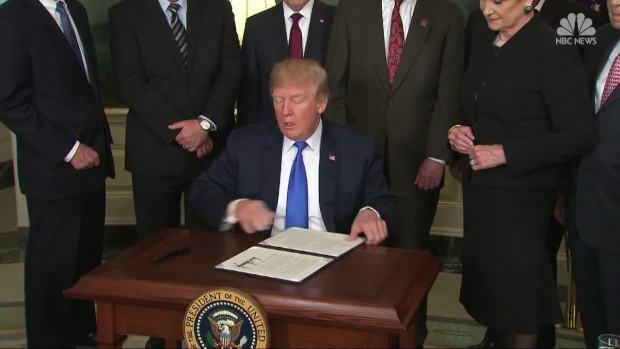 President Donald Trump announced Thursday new tariffs on nearly $60 billion worth of Chinese goods. The Dow Jones industrial average plummeted 723 points amid worsening fears of a trade war. China is promising to retaliate, with industries from agriculture to airplanes in the cross-hairs. NBC News’ Blayne Alexander reports. Some analysts say that for now, Trump might have wanted mainly to smooth over relations with China before his planned June 12 meeting with North Korean leader Kim Jong Un. The U.S. needs the help of Beijing, which wields influence in Pyongyang, to help seal North Korea's border and prevent goods from reaching Kim's regime in violation of international sanctions. The U.S.-China trade truce drew fire from some who had applauded Trump's campaign pledge to overturn decades of U.S. trade policy and crack down on China and other trading partners they accuse of abusive practices. "More false promises and delaying tactics," tweeted Dan DiMicco, a former steel executive who served as a trade adviser to Trump during the presidential race. "Been there for 20+ years. It needs to be different this time as promised." Still, the Trump administration trumpeted what had been achieved in two days of talks. The president tweeted: "On China, Barriers and Tariffs to come down for first time." Treasury Secretary Mnuchin predicted a big increase — 35 percent to 45 percent this year alone — in farm sales to China and a doubling in sales of energy products to the Chinese market. Trade analysts and China watchers were underwhelmed. Stocks took a beating Thursday, with the Dow Jones industrial average dropping 723 points amid worsening fears of a trade war. The drop came as President Donald Trump announced new tariffs on nearly $60 billion worth of Chinese goods. Trump insists the tariffs stop other countries from taking advantage of America. "If they charge us, we charge them the same thing. That's the way it's got to be," the president said. "Energy exports to China are already soaring," Derek Scissors of the conservative American Enterprise Institute wrote in a blog post. Mnuchin is "promising to win something already happening... the U.S. is folding again." Lighthizer last summer began investigating Beijing's tactics to challenge U.S. technological dominance. These include outright cyber theft of U.S. companies' trade secrets and China's demands that American corporations hand over technology in exchange for access to the Chinese markets. Last month, the administration proposed tariffs on $50 billion of Chinese imports to protest the forced technology transfers. Trump later ordered Lighthizer to seek up to an additional $100 billion in Chinese goods to tax. China responded by targeting $50 billion in U.S. products, including soybeans — a direct shot at Trump supporters in America's heartland. The prospect of a trade war has shaken financial markets and alarmed corporate executives. So some business groups were relieved by the cease-fire. Stocks closed higher on Monday as trade tensions dissipated for the moment, while investor sentiment was also boosted by news of dealmaking activity. 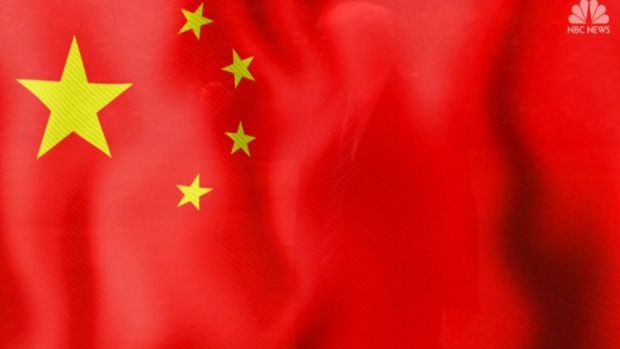 "We're pleased that the two sides apparently made enough progress to dial back on the tariffs and other threats," says John Frisbie, president of the U.S.-China Business Council. But Frisbie said he wanted to see further progress in addressing U.S. businesses' complaints about how they are treated in China. In particular, the statement the two sides issued skirted over the key issue of forced technology transfers from the United States to China. 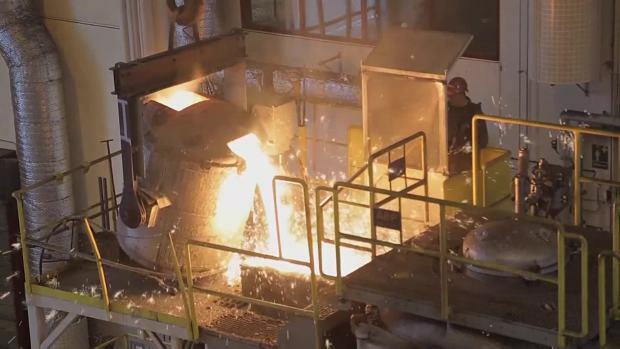 World markets respond to President Donald Trump's plans to impose heavy, punishing, penalties on foreign steel and aluminum; raising fears of a global trade war. Trump plans to put a 25 percent tariff on steel imports, as well as a 10 percent tariff on aluminum imports. "They failed to drill down on the biggest frictions facing U.S. businesses and on those where we are most able to move the Chinese," said Mary Lovely, a Syracuse University economist who specializes in trade. She said the U.S. was distracted by an "ill-advised focus" on the trade deficit. Lovely said the Chinese, who increasingly have their own technology to defend, might be open to strengthening intellectual-property protections and to pressuring local governments to stop demanding technology transfers. Yet Beijing may not be willing to bargain away its drive to become a technological power in such areas as robotics and artificial intelligence, embodied in its "Made in China 2025" initiative. That project calls for China to develop world-class competitors in fields from information technology to electric cars to pharmaceuticals. "The Chinese would be more than happy to give up their trade surplus," says Robert Atkinson, president of the Information Technology and Innovation Foundation think tank. "They care about one thing, and that's Made in China 2025." "Do we really want to live in a world where we're a third-world natural resource exporter, while the Chinese are the powerful technological machine?"